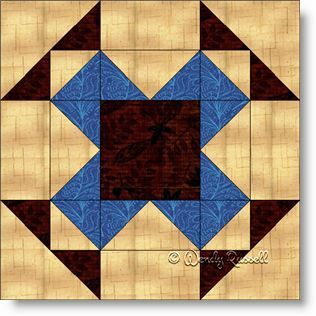 The Rocky Garden quilt block is a basic nine patch block that uses the half square triangles both in patches to make squares as well as individual cut pieces to add on to other patches. You also get to hone your skills making flying geese units. All in all this quilt block is a good choice for teachers to use in a beginner quiltmaking class. The sample quilts illustrated feature one quilt set on point, while the other quilt has blocks set side by side. This last quilt mentioned uses blocks with two of the fabrics reversed in half of the constructed blocks, so that you get a different effect in your final quilt.